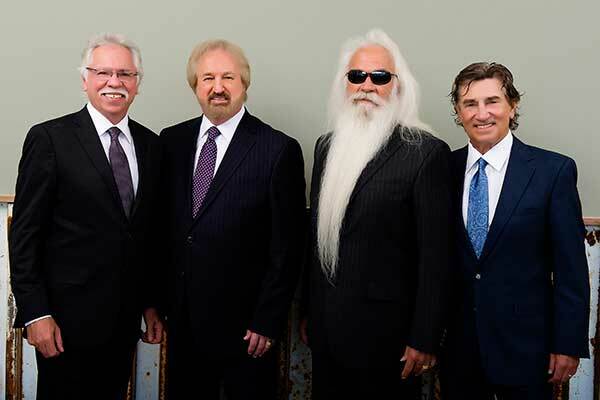 BREMEN, Ga. – Country music legends, The Oak Ridge Boys have joined forces with American companies to place a new emphasis on buying products made in the United States. The Liberty Legends USA program debuted in 2015 and this week announced their launch of their second Legends Series, the “American Made Collection” by The Oak Ridge Boys. The collection will debut with a line of high quality suits, Made in the USA. The Liberty Legends USA Series is a collaboration of Made in America businesses and leaders promoting a movement to buy American, bringing jobs and profits back to American soil. The American Made Collection is now available through the link provided at oakridgeboys.com. "After spending decades traveling across the USA, I have seen the recent closing of many of our manufacturing companies, mill towns, and hometown businesses. When these places close, manufacturing is often relocated overseas, and we not only lose jobs, but Americans often must find a new line of work," said Duane Allen. "I am happy to be a part of Liberty Legends USA with its goal of keeping our factories and our mill towns open and providing good quality Made in America products. These products might cost a little more, but they’re an investment in our country's economy. Buying Made in America provides an opportunity for our businesses to grow, while Americans earn a fair wage." Nov. 19 Memorial Hall - Independence, Kans. Nov. 24 Coronado Performing Arts Center - Rockford, Ill.
Nov. 25 Carson Center - Paducah, Ky.
Nov. 27 Mayo Performing Arts Center - Morristown, N.J.
Nov. 30 The Palace Theatre - Greensburg, Pa.
Dec. 01 Smoky Mountain Center for the Arts - Franklin, N.C.
Dec. 02 Renfro Valley Entertainment Center - Renfro Valley, Ky.
Dec. 03 Niswonger Performing Arts Center - Greeneville, Tenn.
Dec. 06 Tennessee Theater - Knoxville, Tenn.
Dec. 07 The Center for the Performing Arts - Carmel, Ind. Dec. 08 Southern Kentucky Performing Arts - Bowling Green, Ky.
Dec. 09 Gold Strike Casino Millennium Theatre - Robinsonville, Miss. Dec. 14 FireKeepers Casino Hotel - Battle Creek, Mich.
Dec. 15 Treasure Island Resort & Casino - Red Wing, Minn.
Dec. 16 Crystal Grand Music Theatre - Wisconsin Dells, Wis.
Dec. 17 Star Plaza Theatre - Merrillville, Ind. Dec. 20 The Ridgefield Playhouse - Ridgefield, Conn.
Dec. 21 Luhrs Performing Arts Center - Shippensburg, Pa.
Dec. 22 The Capitol Center for the Arts - Concord, N.H.
Dec. 31 Rising Star Casino Resort - Rising Sun, Ind. The Oak Ridge Boys, who have sold over 41 million units worldwide, are synonymous with “America, apple pie, baseball, pop, rock, gospel and country music.” In addition to their awards and accolades in the country and pop music fields, they have garnered five GRAMMY® Awards and nine GMA DOVE Awards as well as the Mainstream Artist of the Year Award at the ICM Awards. The group—Joe Bonsall, Duane Allen, William Lee Golden, and Richard Sterban—have earned prestigious membership in the Country Music Hall of Fame (2015 Inductees) and Grand Ole Opry, and are known worldwide as one of recording history’s most extraordinary musical successes. They have charted single after single and album after album, celebrating two double-platinum albums and more than 30 Top 10 hits, including No. 1 chart-toppers “Elvira,” “Bobbie Sue,” “Thank God For Kids,” “American Made,” “Y'All Come Back Saloon,” among dozens more. For more information and to view upcoming tour dates for The Oak Ridge Boys, please visit www.oakridgeboys.com. The Liberty Legends USA mission is a collaboration of Made in America businesses promoting a movement to Buy American, bringing jobs and profits back to American soil. The program debuted in 2015 with a line of high quality western jackets and dress jeans made in the United States and carrying the Larry Gatlin name. Mill Town Music Hall, Bremen, GA is the movement’s principal sponsor. The clothing is made by Threads, Inc. Threads is a company owned by Robin Sewell Worley, who is the grandson of Warren Sewell, the co-founder of the Sewell Companies, the men’s suit company that was established in the south in 1918. The partnership of Mill Town Music Hall and Threads along with other sponsors and endorsers is gaining ground by growing awareness of the impact of Made in the USA mission.